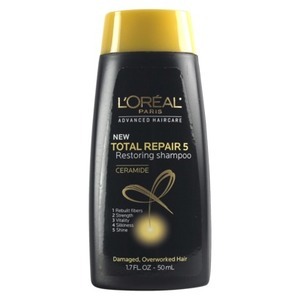 I received a sample of the total Repair 5 restoring shampoo and I absolutely loved it. 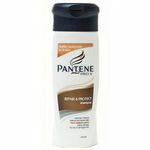 I have very hard water and sometimes shampoos do not like to lather for me but I had not problem with this shampoo lathering. I felt like my hair was completely clean and the best part is my hair smelled amazing! I love the scent of this shampoo. Since I loved the sample so much I purchased the full size and I have not been disappointed in that purchase yet. I have been using this shampoo for 3 months now and I still love it. Lathers nice and has a lovely fragrance!! My hair is shiny and full of volume!!! Works better then I expected! I was so suprised by this stuff! 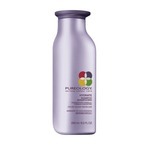 I used both the shampoo and the conditioner and was so happy with the results the very first time I used it. I have extremely long and thick hair so more often than not, products don't work for my hair. Also finding shampoo and conditioner that works for myself and both of my daughters is also a struggle. One of my girls has thin hair that is easily broken and weighted down and my other girl has thick and long hair that is very prone to tangles and is very hard to detangle and manage. This worked for both of their hair as well as it did for mine. The shampoo is gentle, but cleans hair well. It doesn't weigh hair down and not much is needed to achieve great results. 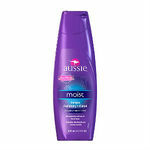 If you use it with the matching conditioner it will work wonders! I've never seen my hair so soft, shiny, easy to brush, and manageable. I highly reccomend both to everyone. It smells very good too! I have to go out and buy more now that I've seen what it does. As we keep using it it feels like our hair is improving and that's a definate plus. I hope they continue to make this or I will be lost. We no longer need additional products to add shine, or make our hair easier to style or make it easier to brush. It's all around a great product and I think everyone should give it a try! I started using this product last year. It worked really well at first, but after a while I noticed that the effects weren't what they used to be. It lathered really well and cleaned my hair, but seemed to be causing more split end the more I used it. My hair is really oily at the top, but really dry at the bottom. The shampoo revived my hair some, but after using it for about four months I had to quit using it because it was making my hair worse than what it originally was.